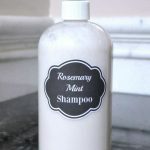 A few months ago I shared my recipes for homemade beauty products using rosemary essential oil. One of those recipes was for a hot oil treatment for your hair. After several weeks of using the hot oil treatment, I realized that I wasn’t losing as much hair when I would shampoo. Believing the rosemary had something to do with this, I added several drops to my store bought shampoo. Beforehand, I would have almost an entire handful of hair to clean out of the shower drain after every shower. After I added the rosemary to my shampoo, I didn’t notice any lost strands in my fingers and hands as I showered (though I still have to pull a few out of the drain every time I clean the shower). 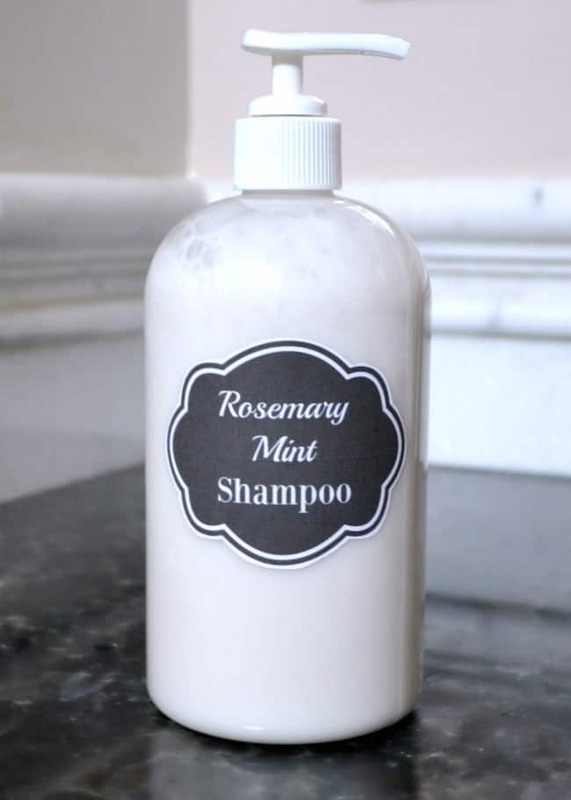 When my store bought shampoo ran out, I decided to make my own Homemade Rosemary Mint Shampoo. There are a LOT of DIY shampoo recipes out there. I know, because I read dozens of them. Essentially, they all call for the same basic ingredients (coconut milk , castile soap , and essential oils). Some throw in an additional oil (e.g. olive oil, almond oil, or Vitamin E oil). I tested 4 or 5 of these recipes and wasn’t quite happy with the final outcome. Sometimes the shampoo didn’t have enough scent or didn’t include all of the essential oils I thought were vital to an effective shampoo. In other cases, the proportion of coconut milk to castile soap wasn’t ideal. Too much coconut milk and you don’t get any suds. Too much castile soap and your hair feels stripped. I played with the ingredients until I found the combination that I liked best. Coconut milk will go “bad” after a while. I added vitamin E oil to my recipe to help act as a natural preservative. You can keep the shampoo in the refrigerator to help it last longer, but I keep mine in my shower and haven’t noticed any negative effects. In addition to the rosemary oil, I also included peppermint because besides pairing great with rosemary, it’s one of the scents that just makes me happy. I also added a few drops of tea tree oil mostly out of habit from when I worked in an elementary school and was advised to add it to my shampoo to ward off lice, but it is also said to be beneficial for dry scalps and for dandruff so it was an obvious shampoo ingredient choice to me. NOTE: After your wash your hair with this shampoo, if your hair feels heavy or like it still needs to be rinsed, use a little cider vinegar. It works great! Combine all ingredients in 16 oz bottle. Replace pump/lid and shake well. Store in fridge or in cool, dark place. 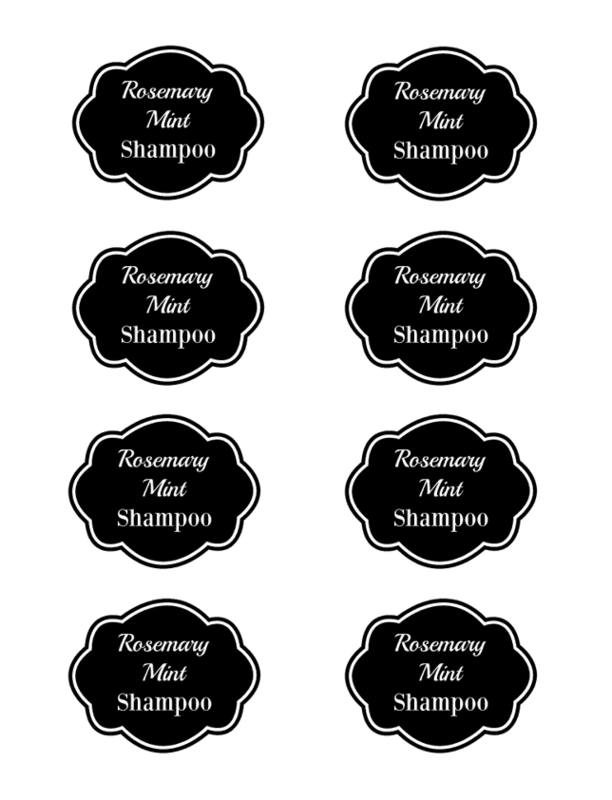 A couple of weeks ago I shared my recipe for Homemade Lavender Vanilla Bubble Bath and I created some printable labels. Since I used the same bottle for my shampoo (I bought a pack of 6), I went ahead and made some labels for the shampoo too. The labels were made to fit Avery Name Badgecas Labels. How long will this shampoo last in the shower, as far as the coconut milk goes? I might need to half the recipe and not make so much if it goes bad quickly. In the shower it won’t last longer than a week. I tried it a couple of times when I kept forgetting to get it out of the refrigerator before my shower. Smart idea to reduce the recipe. Tried this for the first time and my hair feels like something didn’t wash out fully. It’s oily-ish…Hard to brush my fingers through it. This was how my hair was immediately after the shower when I used a blow dryer to dry it. I don’t think it’s my body detoxing – feels more like the shampoo just didn’t rinse well. Any tips? I’d love to try again! Use cider vinegar to rinse. I’m adding that to the post now. It works great! Castile soap is not a sulfate so it will leave a residue on hair. I’m floored that I come across so many recipes for shampoo with this ingredient. I don’t know anyone who has ever had success with it. What type coconut milk do you use in this recipe? Full fat canned milk? The carton of coconut milk you buy to drink like regular milk. I would like to try your recipe if you clarify the type of coconut milk. Hi Jenny, I use the full fat canned milk. Thanks for asking! I’m going to update the post now to make that clear. Fat is excellent for hair and skin. Use as much fat as you can. i read that if you have high blood pressure it was not to be used why is that. i would like to try making my own shampoo. Hi Betty, first, I have to reiterate that I am NOT a doctor so if you have serious concerns about your health, please don’t rely solely on my layperson advice. That being said, the notion that rosemary is bad for people with high blood pressure seems to originate with a book written in 1964 by Dr. Jean Valnet who identified rosemary, hyssop, sage, and thyme as being harmful for individuals with high blood pressure. The two sources he cites in his research are studies on hyssop and clary sage oil. Also, his assertion that the ill effects were caused by ingestion of the oils, not external use. I have not been able to find any actual studies that come to the same conclusion. This is my long way of explaining that the reason a belief persists that rosemary is bad for blood pressure is based on a flawed book written over 50 years ago. If you have concerns about rosemary though, you can try substituting lavender which has a pleasant scent and is associated with benefits for your hair and scalp. I experimented with quite a few natural shampoos before I finally found one I liked. Might have to try this one. I can almost smell it! This sounds lovely! I love homemade beauty products, and can’t wait to try out this recipe! Oooh, I love the smell of rosemary. I’ve been starting to make my own homemade beauty products, too. Thanks for the shampoo recipe.